As you know I have 4C hair and it’s extremely difficult for me to find products which give me moisture and also help to retain that moisture. I’ve heard about all the good properties of aloe vera but never actually tried it for myself. As the last straw (since majority of my products have been running out) I decided to source some aloe leaves. Next step was to venture onto Youtube university to learn how to apply it to my hair. After watching various videos from different individuals I came up with 3 uses that may benefit me. I only decided to go with two and still used my trusted coco creme deep conditioner. So, I’ve heard about pre-pooing for awhile but never actually tried it until my last wash day where I used warm honey mixed with olive oil. Pre-pooing is a method done before you wash your hair as a means of protecting it from harsh stripping after shampooing. You can leave a pre-poo treatment on your hair for any time between twenty minutes and overnight. For my Aloe Vera Pre-Poo treatment I simply mixed the gel extracted from the plant with olive oil and applied it to my hair. I massaged it into my scalp, applied it to the ends and twisted my hair. I decided to leave it on overnight in hopes of extending the full benefits to my hair. It’s wise to deep condition your hair each time you use a clarifying shampoo. This is done to restore moisture and keep your hair strong. Deep conditioning also helps to make your hair more manageable while adding shine. To get the most out of your deep conditioner ADD HEAT. Adding heat makes it easier for the product to penetrate your hair shaft, also if you have low porosity hair this is key. The recipe to deep condition is basically the same as the pre-poo but you can add additional oils of your choice. After shampooing and conditioning, simply treat it as your usual deep conditioner. The obvious one since most of the aloe vera products are gel based. I used this gel to finger coil my hair. This is also the first time I’ve done this style, it took damn near two hours. They also ended up being different sizes as I was getting tired in the end. However, throughout the process I switched from the aloe vera gel to Ecostyler because I didn’t like how clumpy it was. It also left white particles on my hair (probably since it wasn’t blended). Since then I’ve stopped using Ecostyler not only because of the news articles but it always makes my hair crunchy. You know how you watch Youtube videos and they make everything seem so easy and cool? I should have known after trying mayonnaise in my hair once that this wouldn’t be pretty. First off I took the lazy easy way out and decided to whisk the mixture with a fork as opposed to using a mixer/blender. In some of the Youtube videos I watched however they simply opened the aloe vera plant then rubbed it directly onto their hair. I’m also realizing that they used mainly coconut oil with their mixtures. Everyone has been raving about coconut oil but I personally haven’t tried it yet. Maybe I may try this treatment again differently with coconut oil and using a mixer so it’s fully blended. Thus I can’t say for sure if I received the full benefits. There you have it, I gave you some benefits along with different ways to receive these results. The best part about all of this is, you can either source these leaves in your area (Caribbean) or buy them at the supermarket. I heard that they’re fairly cheap around $US2. 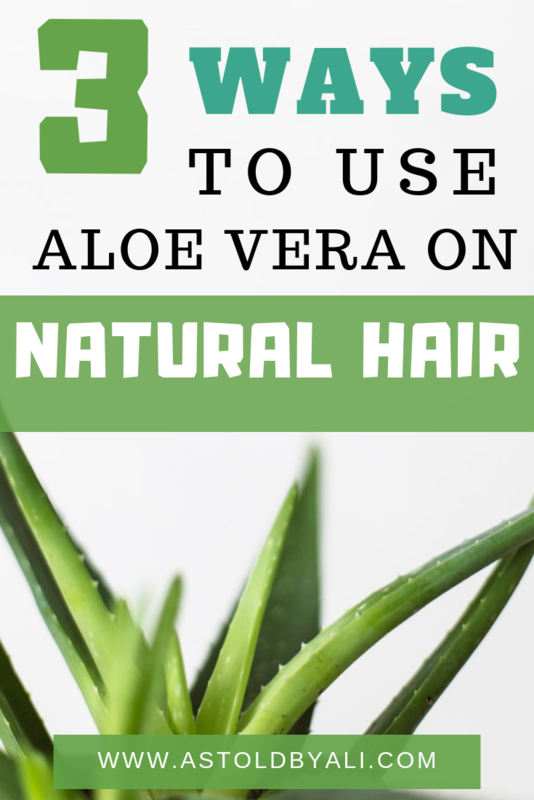 Have you ever used Aloe vera on your hair?